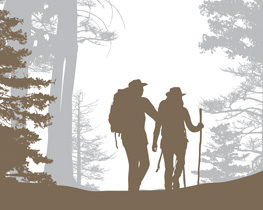 Over 8,000+ hikes, walks, canoe and kayak outings, and bike trips, singles events, backpacks, ski activities, and other outdoor events annually—plus conservation, trail maintenance and outdoor leadership training. Make AMC your connection to the great outdoors! AMC has 110,000 members, outdoor advocates, and supporters; 16,000 volunteers; and 12 chapters from Maine to Virginia. It is the oldest outdoor recreation and conservation organization (circa 1876) in the nation. Volunteer leaders do their best to facilitate safe, quality events. Your participation in these trips, however, acknowledges that there are inherent risks in any outdoor activity that cannot be entirely eliminated. You will therefore be required to sign a liability waiver to participate in any AMC event other than social activities. To view the liability waiver and the AMC "Leadership Requirements and Guidelines" which all AMC leaders follow, click here.